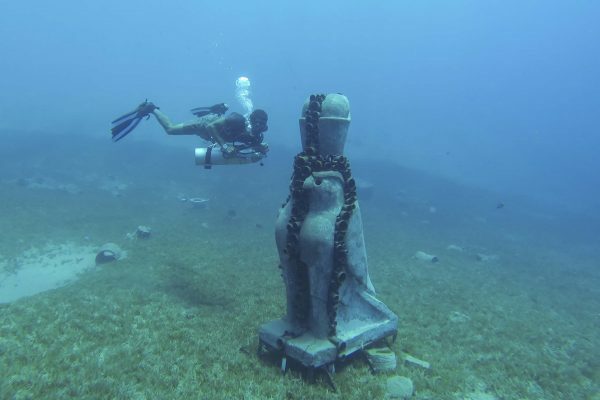 A group of professional scuba divers, I-Dive Tribe, have launched a museum under the waters of the Red Sea in Dahab, installing statues made of environmentally-friendly materials on the seabed to preserve coral reefs. 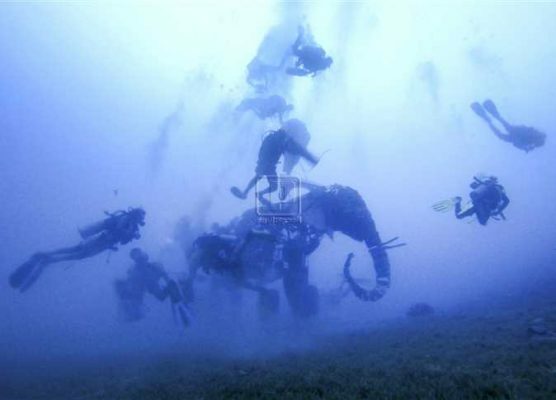 A group of professional scuba divers have launched a museum under the waters of the Red Sea in Dahab, installing statues made of environmentally-friendly materials on the seabed to preserve coral reefs. The project was founded by I-Dive Tribe who began their journey a few years ago; they’re a community of professional divers who have different careers but are unconditionally passionate about diving. They facilitate recreational dives under the Red Sea water and strongly advocate for the preservation of coral reefs and marine life. At the Dahab festival in 2012, I-Dive tribe installed the first phase comprising three statuses including a donkey-shaped table and two chairs at the Magra al-Seil area. 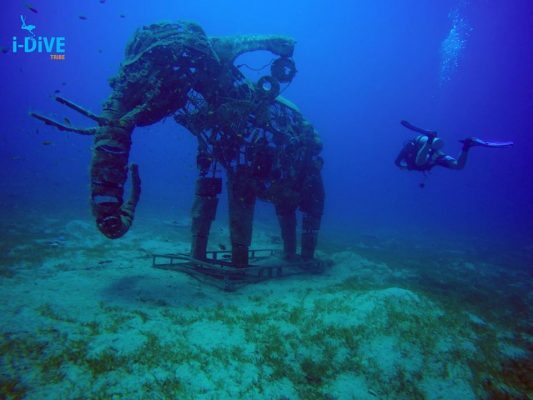 Three years later they placed another three other statuses at the lighthouse diving location: these were of the pharaonic gods Horus and Bes, and a 700kg elephant statue. 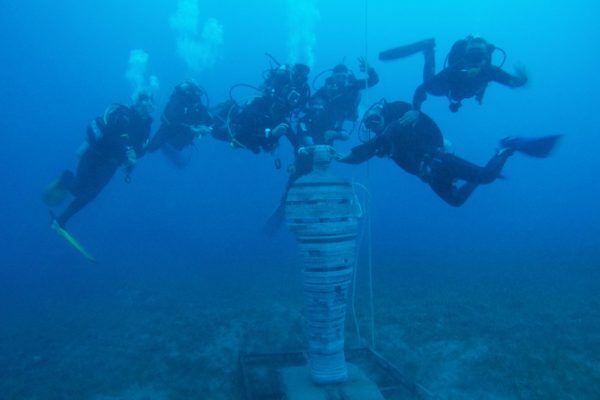 Most recently on February 2, the team successfully submerged the seventh statue to honor the Egyptian diver Ahmed Gabr who hit the world record of the deepest dive. This statue is made of 100 pieces of granite and resembles an academy award; it looks like the ancient Egyptian god Petah. Frequent diving, at a higher rate than is recommended, has caused coral reefs to die. Elmekkawi said Egypt is a popular destination for scuba diving owing to its low costs and lack of any capacity rules which limit too many diving trips which. Consequently, the reefs’ wealth has become damaged. “The project will reduce this traffic by creating alternative dive sites and attracting tourists and divers to view the underwater museum,” he said. Moreover, the statues were designed so as to promote the creation of new coral reef; some were made with open-ended steel tubes to provide holes where coral reefs can regenerate and small marine creatures may find shelter from predators. 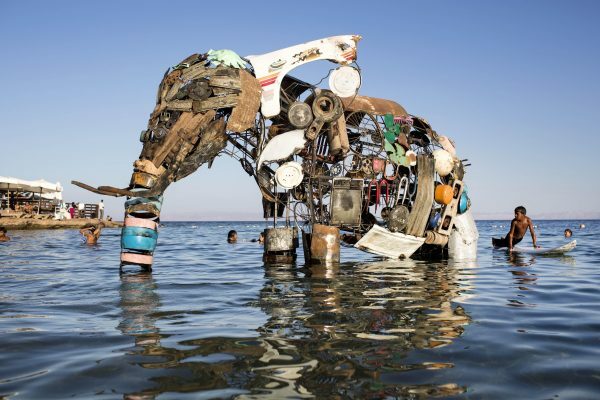 “The elephant statue attracted huge number of tourists in Dahab. We’ve already seen coral reef flourish and marine life taking refuge in the statues,” el-Mekkawi said. All the statues were designed and created by Hamed, artist and assistant lecturer at the University of Arts in Luxor; he learned to dive and studied marine biology so as to understand how to create the most suitable design with the correct materials, el-Mekkawi said. 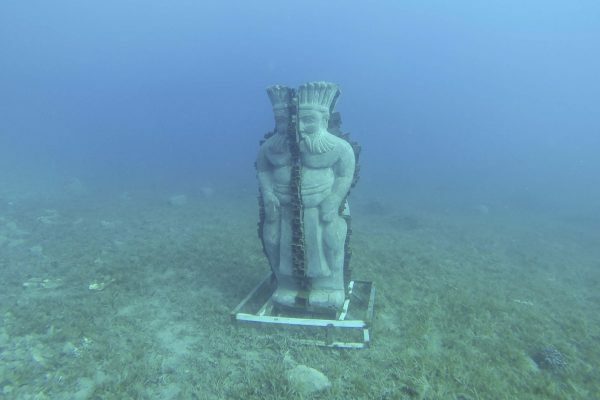 “At the start, we met with officials from the reserves authority and the water surfaces department, along with marine and environment experts, to discuss the most suitable places and materials for the statues,” he said. The I-Dive Tribe sent questionnaires to professional divers to ask their opinion on the best diving location in the Sinai peninsula — most respondents preferred Dahad, a beach town about two hours away from Sharm el-Sheikh. Although the Egyptian Tourism Authority (ETA) does care about the museum and the team’s work, el-Mekkawi believes the government is not provided enough support for the project to move forwards and survive. “The project needs to be a national initiative embraced by the country to save the wealth of our coral reefs,” he said. “In Mexico more than 400 permanent sculptures, created by Jason deCaires, were installed in the National Marine Park of Cancún as part of a major art project called “The Silent Evolution”, the project was fully supported and funded by the government. However, for our museum, it took such a long time for the necessary documents to be processed in order to install the seventh statue,” el-Mekkawi said. The museum is solely funded by I-Dive Tribe and there are no other sponsors. Talking about future plans, el-Mekkawi does not have intention to move to another Red Sea spot at the moment because he loves Dahab unconditionally. Plus the town is attracting far more tourists nowadays. His dream for the future is for huge numbers of underwater museums to be built to protect more coral reefs. The team’s next statue may take from one to three years to be designed and installed. 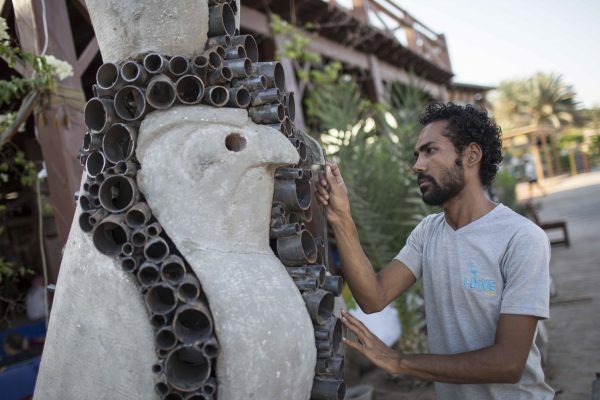 “After designing the sculpture we install it and watch how it adapts to marine life and motion, then we pull it up and reinstall it if everything is fine,” el-Mekkawi said. “It’s not possible to install several statuses [on the seabed] at the same time. Initially I wanted to install 25 statues all t once, but environmental experts said this method could harm marine life so it’s better to only submerged two or three in the beginning,” he said. Ahmed Gad, the professional diver who reached a world record for the deepest dive, told Egypt Independent the initiative is very promising but needs governmental promotion. He added that the museum will reduce the pressure on coral reefs which have endured a high number of diving trips, especially the Red Sea which has rich marine life. “In the UAE, they put tires on the seabed to allow reefs to regenerate and grow, such a simple project was highly supported in the country,” he said.